In conjunction with Study Skills Seminars for 3rd and 6th years Rory Mulvey from STUDENT ENRICHMENT SERVICES will give a talk to parents of ALL students on how parents can support their second level students. The Annual General Meeting of the Parents’ Association will also take place The Parents Association are involved in working with the Principal, teachers and students to help in anyway we can to support the school. We fundraise annually and help with a number of activities from the school musical, graduations and special events. We would welcome new members to the committee. We meet once a month during the academic year, so please get in touch if you would like to join us by completing the form below. Every parent/guardian is eligible to join the committee. If this is not for you, you might consider providing us with your contact details to help out at one of our events. Please consider becoming a volunteer. The Honorary Secretary, Parents’ Association,c/o Portmarnock Community School, Portmarnock Co. Dublin. We meet on the first Tuesday of every month at 7.45 pm, to discuss issues and projects of importance to the school. We also organise vital fundraising activities throughout the year. Any parent is welcome to be on the committee and election of new members takes place at the AGM, which is held every October. Minutes of our meetings are emailed to the committee members before the next meeting, so that issues can be dealt with and discussed more efficiently. The Parents’ Association is affiliated to PACCS, which is the Parents’ Association body for all Community and Comprehensive schools. Our Parent Representatives attend their meetings, including their AGM, during the year. Through PACCS, the Parents’ Association is also linked with the National Parents’ Council for Post-Primary schools (the NPCpp) and our representatives attend their workshops and conferences on behalf of the parents of PCS. NPCpp Free Spring Seminar on Cyberbullying: please click here to see details. 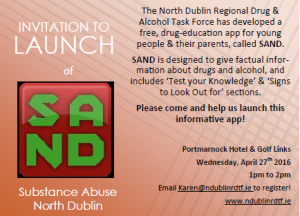 This very special conference will take place on Saturday, 11th March, in the Carlton Hotel, Blanchardstown. Featuring international expert Dr JeromeSchultz, an award winning Clinical Neuropsycholgist and Lecturer on Psychology, Dept. of Psychiatry Harvard Medical School, this conference will provide you access to to leading experts and top quality information to educate, support and empower those who work with and parent children with special educational needs. This conference will be of particular interest to those who work with or parent childrenwith a variety of special educational needs such as adhd, autism spectrum disorders, down syndrome, dyslexia, dyspraxia, intellectual disabilities and more. If you work with, care for or parent children with special educational needs this is a not to be missed event! The event is free with Tea / Coffee and lunch provided. Re: Bag Pack fundraiser: €2,186! Congratulations to all of the Parents and Students who gave so generously of their time in order to Bag Pack on 25th – 26th March, for the School Musical. They raised €2,186 euro! A huge ‘Thanks’ to all of you! Our sincere gratitude to the Management of Dunnes Stores who so kindly facilitated this fundraiser. They have been consistently supportive of PCS and we truly appreciate it. Professor Guy Claxton, Emeritus Professor of the Learning Sciences at the University of Winchester, visiting Professor at King’s London, Co-Director of the Centre for Real-World Learning and Graham Powell, Director and Principal Consultant with The Learning Organisation, formerly head-teacher and school inspector were present on the day. In the Tullamore Court Hotel, on Saturday, 5th of November. The National Parents, Council provides a Helpline for Parents, during this time. The Helpline is provided courtesy of the National Parents’ Council in association with the ‘Irish Independent’, eir and supported by the Dept. of Education & Skills. The Institute of Guidance Counsellors are employed to provide qualified guidance counsellors to give advice and support to both students and their parents. SUSI opened the online application system for Student Grants for the academic year 2016/17 on April 5th 2016 for both new and renewal applications. On behalf of the Parents Association I would like to highlight the situation regarding the K Compound in Portmarnock Community School. The current structure of prefabricated buildings was built 30 years ago and is now 6 years past the projected structural lifespan of this type of timber. The ‘K Compound’ is experiencing a rapid rate of decline with heat loss and poor natural light. Following an independent assessment it was advised that these buildings will, in the immediate future, become uninhabitable such is the rate of deterioration. To us this raises serious issues for the teachers and students to be accommodated in such conditions on a daily basis not to mention the health and safety concerns. The ‘K Compound’ buildings are no longer fit for purpose and we the parents/guardians and the wider school community cannot wait until 2019 for the commencement of their replacement which realistically, due to the planning applications, appointment of design team, the tender process etc., will not happen until 2021 at the earliest. Based on an independent assessment in January 2016 and the real concerns of us as parents/guardians of students attending this school, we hope you can now see the urgency with which our ‘K Compound’ needs replacement. Whilst we appreciate the announcement that a redevelopment programme has been approved, the commencement of this in 2019 will be too late! Parents and Students raise €2,185 for TY Musical! A sincere ‘Thank you!’ to the Parents and Students who gave so generously of their time to raise funds for the TY Musical! They raised €2,185! These funds are warmly welcomed by the organisers of the musical. We would like to thank the Management of Dunnes Stores, who so kindly facilitated this fundraising event by providing PCS with two key slots – Friday 30th and Saturday 31st October. The 30th NPCPP Conference will take place on Saturday 14th November, 2015, in Killarney, Co. Kerry. The Conference programme includes presentations on access to College, the benefits of the HEAR and DARE programmes, how students gain from engaging with the TY programme, the effects of Drugs and Alcohol on our children, the importance of Guidance Counselling in schools and your Legal Rights as Parents. The full programme of talks is available by clicking here. All are welcome. Admission is free. Please register in advance. Congratulations to all of the Junior Cert. students! Sincere congratulations to all of the Junior Certificate students! Your results were superb! We are all really proud of you! Congratulations to the Leaving Certificate students who received their results this week. We wish you every success in your future career paths. Well done! Thank you to all of the staff who worked so hard over the last six years to provide these students with a well-rounded education at PCS. The Parents’ Association would like to congratulate the 6th year and TY students who graduated this week. Both of the Graduation Ceremonies were outstanding and a true reflection of the hard-working students and the dedicated teachers in PCS! The amount of work, which was put into both ceremonies, was incredible. A huge ‘Thank you’ to the members of the PA committee, and to other Parents, who helped out so generously with both ceremonies. We wish our students ever success in the future. May you continue to map your futures with the values of courage, respect and joy and with a true sense of justice for all.